Generalized source of volumetric information. 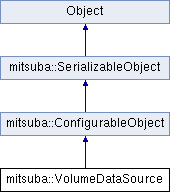 Unserialize from a binary data stream. Return the maximum floating point value that could be returned by lookupFloat. This is useful when implementing Woodcock-Tracking. Return the recommended step size for numerical integration or inifinity if this is not known/applicable. Look up a floating point value by position. Look up a spectrum value by position. Look up a vector value by position.